Here you can search our set-price new baby hampers by type. 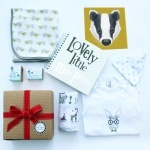 We have a range of the best award-winning newborn boys and girls gift sets to suit every taste and budget. What are baby hampers and baby gift baskets? A baby hamper is a selection of beautifully displayed newborn gifts. These are given as a present to friends or loved ones, after the arrival of their new little bundle. Traditionally, presents like this have been given displayed in a wicker gift basket, but here at The Baby Hamper Company we like to do things a little differently, and ours come in our luxury recycled boxes. Who are our hampers for? At The Baby Hamper Company, we have a great selection of hampers and gift ideas to suit all tastes. Whether you need a baby hamper for boys or girls, a unisex box if purchasing before the baby is born, or even for twins, we have the best range to choose from. They make really special gifts for after the infant is born, but equally good for occasions such as a baby shower before the baby is born. We have our ever popular 'Not Your Standard' hamper range, for something bright and colourful, that's just a little bit different. The 'Pure White' range is unisex, neutral and entirely white! These are suitable for a pre-birth gift or a baby shower idea. The 'Really Useful' range contains products that are tried and tested and recommended by new mums. Our Luxury range, filled to bursting with everything new mums and babies could want, from super cute baby clothes, baby bibs, newborn essentials, treats for mum and baby skincare. 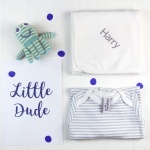 The Personalised Baby Hamper range, includes a selection of gifts that can be personalised with the new baby’s name, to give a truly bespoke and original gift. Our site also gives you the flexibility to create your own baby hamper, where you can choose from our extensive selection of newborn baby and mum gifts, see our 'ALL PRODUCTS' section. Simply add the items you require into your basket and we pack them all together in your own bespoke baby hamper gift. We have gifts starting at just £2 and hampers priced up to £150, so we really do have a good range to suit all budgets. How do you wrap a baby hamper? Traditionally baby hampers are wrapped with shredded tissue inside a wicker basket and covered in cellophane and a bow, but we have taken a modern approach to the wrapping. Our hampers are surrounded by a recycled cardboard gift box and surrounded by a luxury hand-tied red ribbon and gift message card. Inside the gifts are delicately and securely wrapped in tissue to ensure your present arrives with your new parents in the same condition that we send it out in. How to make a baby hamper basket? You can make a baby hamper basket at home yourself by collecting a variety of gifts suitable for a newborn baby and displaying them in a basket or box ready for gifting. However, this can be quite a time consuming and end up costing a lot of money. We have a selection of great value for money hampers that won't break the bank and you can be confident that the contents contain the most up-to-date mum and baby gifts and will be both beautiful and useful for new parents. What do you put in a baby hamper? Baby hampers are filled with a variety of presents to welcome a new baby into the world. Financially a new baby is quite a burden to parents, so clothes always a welcome addition and buying some really special designer outfits is always a real treat. Baby toys are also essential to any good baby hamper basket. Choosing a toy that is also an activity for baby is a great idea, as they provide ideal entertainment for little ones whilst out and about. A little treat for Mum is a thoughtful addition, such as a soothing aromatherapy candle or bath truffle, anything along those lines will be very gratefully received. Other baby essentials such a muslin cloth, baby skin care and blankets help make a really special newborn gift. Why choose The Baby Hamper Company for my gift? All of our products have been expertly selected for their unique qualities. We make sure that they are beautiful, well made and they simply must be very useful. As new mums ourselves, we have selected products that we found both really useful, practical and beautiful. All our baby hampers come hand wrapped, include your own personalised message card, tissue, keepsake box, and all topped off with a big red bow! We are perfectionists about our gift wrapping, and make sure that every box we send out is just as we would want to receive it. If we still haven't convinced you just how great our hampers actually are, check out our independent Feefo reviews and see for yourself! 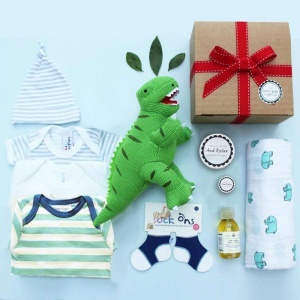 Traditionally baby hampers were seen as handmade baby gift baskets, but we have taken the hassle out of sourcing the products for you, and hand wrap each of our boxes fresh to order. How will my gift hamper be delivered? The Baby Hamper Company is based in the UK but we also offer worldwide delivery options. Place your order before 2 pm on a weekday, and your new baby hamper will be dispatched the same day (personalised gifts not included). All of our hampers are sent via Royal Mail in protective packaging. We offer express next-day UK delivery options, which include Saturdays, so your perfect newborn baby hamper is just a click away!